Sure, we’re all aware of National Oreo Day, Siblings Day, Hamburger Month, etc, etc. etc. So aware that we post all kind of stuff all over the internet! But, how many Facebook posts and public campaigns will you see about, this week, May 15-21st, being National Emergency Medical Services Week? In case it’s not obvious, National Emergency Medical Services (EMS) Week is a week during which we should take some time to recognize those emergency medical professionals that respond to emergency requests for medical and emotional help and provide treatment and, in many cases transportation to a healthcare facility. Additionally, EMS professionals, in many communities, provide non-emergent transport services, taking patients home from the hospital or caring for patients while they are being transferred between healthcare facilities. In 1973, President Gerald Ford authorized EMS Week to celebrate EMS practitioners and the important work they do in our nation’s communities. Back then, EMS was a new profession, and EMS practitioners had only just started to be recognized as a critical component of emergency medicine and the public health safety net. As a little state of the industry update, in many areas, the status of EMS is not so great. The cost of training, work conditions and potential hazards and low wages, has created somewhat of a vacuum in the number of EMS professionals entering the profession vs. the number leaving the profession for other higher-paying, more stable public safety or healthcare jobs. In many communities, a job making fast-food sandwiches pays more per hour than a starting basic EMT makes. In addition, many EMS agencies continue to take a beating, financially, providing an ever increasingly expensive service (new equipment, new treatment modalities, attempts at raising wages to keep staff) while operating under constant pressure of decreasing reimbursements for their work from the health insurance agencies private and governmental. How do I know that it’s National EMS Week? I’m a practicing paramedic in my own community. I have been for many years…worked my way through college doing it. (No, not back when horses transported patients but, almost close to when HEARSES transported patients!) It’s a career and life experience to which I will always be proud of and thankful. OK.. blah, blah, blah blah. It’s National EMS Week, you get it. Please indulge me for a coupla more paragraphs. Despite happening since 1973, mainly, the only people that really know about National EMS Week are the EMS professionals themselves, their families and some of the hospitals to which they transport patients. There is typically very little or no public recognition. So EMS agencies end up doing cookouts or catered lunches for their staff, professional-association-related recognition events for themselves or just trudge along as if this week is no different than any other work week. It’s sad! It’s kind of like you throwing your own birthday party. Take some time to figure out who the EMS professionals in your community are. Mention them on your social media before or after you post your coffee or lunch selfie or Candy Crush score. Simple things matter. If you cross paths with an EMS crew sometime this week, tell them “thanks” for what they do. Maybe offer a pat on the back or, offer to purchase their coffee/drink at the local convenience store. I wouldn’t go as far as to offer run-up-and-scream-aggressive hugs…that might be a little creepy. Additionally, if you own a company, maybe post a “Thank You” sign at your business OR let your local EMS providers know that they are welcome to a discount on your goods/services this week. Not only will the EMS professionals APPRECIATE what you do, you will probably stun the @#$! out of them given the fact that someone even KNEW that it was National EMS Week! So thanks for reading… even more…thanks in advance for promising to take some kind of action this week on behalf of your local EMS professionals… remember, it can be as simple as swapping your Facebook Candy Crush Invitation time for taking time to post a simple thank you note to your local EMS professionals! 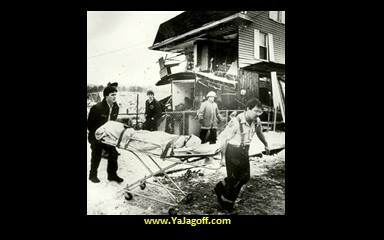 OK… tomorrow, the YaJagoff Podcast episode that was recorded in the back of an ambulance. FYI: the photo above: That’s me on the right a few years ago. I wish I still had that hair and waistline!